If your having trouble with your Freeview signal pixelating or your wondering why your aerial isn’t working. It could be that you have a weak TV signal. In fact, your TV may already be showing a message that you have a “weak signal” or “no signal”. Read this blog for all the info you need on improving TV signal strength. Before we start I just want to make you aware that if you currently have poor TV reception. It doesn’t necessarily mean that you have a weak TV signal strength. You could have too much signal believe it not! With digital TV any problem with the signal will cause the TV picture to break up and this could be many other things like interference and faulty equipment. Now that has been cleared up. Let’s crack on with how to improve your TV signal strength. There is a reason why TV aerials were nearly always installed on chimneys. This is because they provided a fixing point that is typically the highest point of your house, but this isn’t always the case. 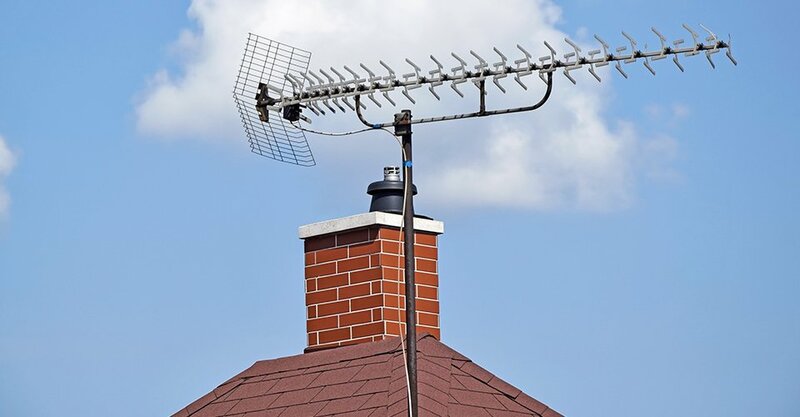 By installing a TV aerial high up on a chimney, or gable end wall or on a fascia you are helping the TV aerial clear all nearby obstructions like neighbouring buildings and trees. When most of these are out of the way a good strong TV signal can usually be received. If you can see you transmitter when installing your TV aerial you will almost always have a good signal. Installing a TV aerial outside is usually the best thing you can do to improve your TV signal. So if you’re struggling for signal with a loft TV aerial. It will be a good idea to move it outside as you will also benefit from the fact that the signal does not need to pass through your roof tiles. To go along with installing your TV aerial outside,installing your aerial higher up will nearly always help improve your TV signal strength. If you live in a weak signal area you may get some benefit from installing your aerial onto a 10’ or 12’ mast instead of a 6’ mast, especially if this helps you clear nearby obstructions. Just remember that when you install an aerial onto a larger mast that the fixings need to be able to support it. A good guide is to ensure that the fixing bracket size is at least 1/6th of the overall mast height. Failing to do this your aerial is likely to blow down in the wind. If installing your aerial on your roof or outside on a wall is not possible and you have an indoor aerial. You will almost certainly get a better TV reception from a loft aerial, only if your loft is not foil lined that is. Another way to get more TV signal is to install a higher gain TV aerial. These are usually unnecessary if you have a TV aerial installed outside on a chimney or gable end wall but If you live in a weak signal area or are going to be running multiple TV’s off one aerial. It may be a good idea to install a higher gain aerial. High gain aerials work by added more elements to the aerial boom which improves the aerial performance which helps improves the acceptance angle and the signal being received. 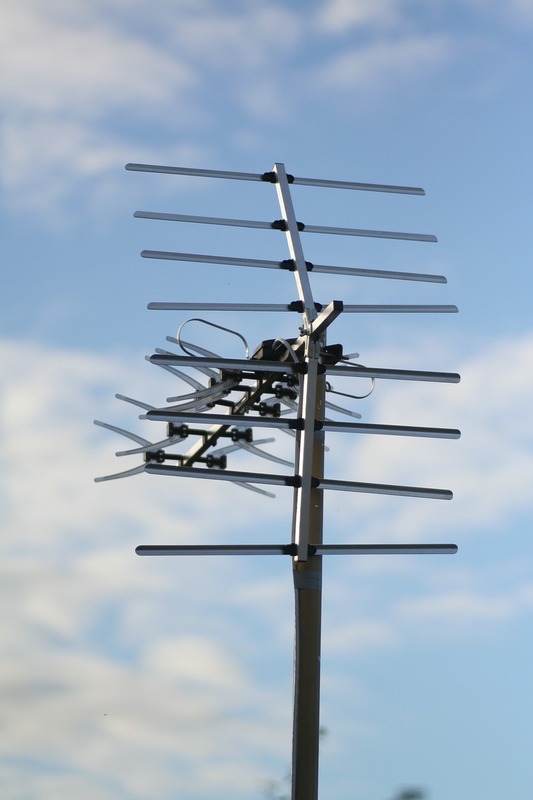 This means that higher gain aerials are always larger than traditional Yagi type aerials so you should also check that the fixings that are going to support the aerial and extra weight are strong enough. I find that installing a bracket size of ¼ of the overall mast height helps and also upgrading the the mast for one with a least a 1.5”diameter, 2” is ideal for high gain and large TV aerials. OK, I understand that this isn’t going to be easy to do without an alignment tool or a TV spectrum analyser but aligning your TV aerial professionally could make a huge difference in the amount of signal being received from your TV aerial. This is especially true with more directional TV aerials, like high gain TV aerials where you have to have to be more accurate with the TV aerial alignment. If you’re struggling getting this right it would probably be best to call out a professional TV aerial company to align your TV aerial for you come and do this for you. If you have tried installing your aerial outside, higher up and with a higher gain TV aerial, or if all of these are not possible. The next thing to try would be to install a masthead amplifier. When installing amplifiers for TV aerials it is best to install these as close to the aerial itself as this will carry as much of the signal through the system and not allow it to become weak at any point. Obviously, this means that the best place to install a masthead amplifier is usually outside on the aerial mast where there is no electrical supply. Fortunately, this isn’t required as a masthead amplifier is powered by a power supply unit which can be installed behind your TV which sends 12V DC up the aerial cable. When I say this should be installed as close to the aerial as possible a cable length of at least 1m should be left between the TV aerial and the amplifier. The masthead amplifier should also be installed before any distribution equipment like TV aerial splitters and distribution amplifiers. So you need to be sure that all your splitters and wall plates are DC passing and not isolated as this will prevent the voltage from reaching the masthead amplifier. There are also distribution amplifiers on the market that will also capable of powering masthead amplifier. 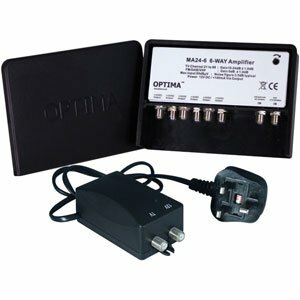 As with all amplification, the amplifier should only be used to overcome cable losses and signal losses associated with the splitting of TV signals to multiple TV’s. That being said you will get some benefit with masthead amplifier where signals coming from the aerial are weak or borderline. Masthead amplifiers come with varying amounts of signal gain and I can’t advise what would be the best for you. Normally I install models with around 13dB gain but adjustable models can be purchased which allow you with a small screwdriver to increase or decrease the amplified signal. If have are running multiple TV’s from one aerial and are using passive splitters. Be aware that the more times you split a TV signal the more signal that you will lose. Whilst this is not normally a problem in strong and reasonable moderate signal areas for up to 4 TV’s. If you live in a weak signal area and/ or want to run 5,6,7 TV’s etc you could be losing a lot of the signal you require in the splitter. By removing a splitter and installing a distribution amplifier with multiple outputs for multiple TV’s you will not only get back the signal lost in splitter but the amplifier will also usually have around 10dB signal gain as well to help overcome cable signal losses. If you replaced a 4 way splitter with a 4 way distribution amplifier with 10dB signal the received signal strength at the TV position will be 18dB more than if you kept the splitter in position. This effect would increase with the greater number of TV’s on your system. You should be aware that whilst this is good for increasing signal strength this isn’t always a good thing in all signal areas. You don’t want the signal being received from your TV aerial being lost on the connecting coax cable by the time it reaches the TV. When installing coaxial cable for TV aerials these should be at least double screened and have a solid centre conductor. If your cable in single screened“low loss” cable or has a stranded centre conductor, you will be loosing an excessive amount of signal down the cable which could cause the TV signal to become weak. Ideally when installing coaxial cables for TV aerials these should have all copper conductors, so a copper braid, copper screen and copper centre conductors. Examples of good quality coaxial cables for TV aerials are WF100,CT100, PF100 and HD100. A lot of the signal being received can actually be lost in the wall-plate itself. If you have an unscreened wall-plate, this is the type where the cable termination is open to the elements excessive signal could be lost through this. By replacing this for a wall-plate with a screened connection where the coaxial cable termination is within a metal enclosure/ casing. This protects outside interference from penetrating into the cable and stops RF leakage which is signal loss. These wall-plate also make for a superior connection and are far less likely to break. If you have a wall-plate with a thin, flimsy factory-made fly-lead coming from it, replace with a good quality fly-lead as these can have huge insertion losses. You don’t need to go crazy and spend £10 on an aerial lead with gold or platinum connectors which some of them have. With a piece of coax cable, a couple of coax plugs, a Stanley blade, cutters and a little bit of DIY skill you can make your own high-quality aerial fly-lead. You may find that a stronger can be received from another transmitter than the one that you’re aligned to. A common situation in our area in East Sussex was to point aerials to Hastings to get Freeview before it was available on the main Heathfield transmitter. When the Heathfield transmitter completed its digital switchover in 2012 a stronger signal could usually be achieved by re-aligning the TV aerial to Heathfield after this date. This is something that we are still doing to this date and you may find that there is a similar situation in your area. Just be careful that your not realigning your antenna to a Freeview Lite transmitters as you will only get around half the services. 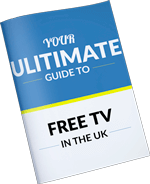 For information on TV transmitters in the UK I advise this site. This goes completely against what I said about installing aerials outside high up, but you might find that by siting your aerial in a spot that helps avoid obstructions which could be impeding your TV signal could work wonders for your signal strength. Installing TV aerials is often referred to as a “black art” and what this means is that often you can get a stronger signal by installing aerials lower down or in locations that seem like they would notwork as will. You will need to spend some time testing in various locations at your property to identify the best location. Just bear in mind that more often than not this is high up on your property. If you have any questions about this blog or anything TV aerial & satellite related. Please leave a comment in the blog comment section below. Please do not call our telephone lines, we don't have the staff to deal with the enquiries and I don't have the time. Please also do not e-mail, I get asked the same questions over and over again. If you put your question below everyone reading the blog will get the benefit of the question asked and the answer given. Thank you!